Moto G was a huge success for Motorola after it almost went out of the market, but they created some phones with Google that were too amazing, and Moto X and Moto G were proven to be a success. Especially, Moto G was sold like hot cakes in the developing countries due to its features, powerful specs and the most important, it was pretty wallet friendly. But now,Moto is ready to hit the markets in developing nations and to give a tough competition to some budget feature packed phones like Nokia Lumia 520 and 525 and a couple more. And it may be called Moto E, as some sources indicate. Here E means “EVERYONE”, a phone which can be purchased and used by everyone. Looks like Motorola is trying to make its place in some budget android phone manufacturers, but with better features and performance. The Moto E is rumored to feature a 5MP camera and 4.3-inch HD display. It will be powered by a 1.2GHz dual-core processor with 1GB of RAM. But it might have low internal storage of only 4GB, Motorola is definitely going to provide a microSD card slot for memory expansion. The earlier leaks suggest that it will pack a 1900mAh battery, which will be more than enough, for a budget smartphone. Motorola is also said to be working on a rugged version of Moto G called the Moto G Forte which was spotted on their official website earlier and it will have similar specs as the Moto G in a rugged Grip Shell body. 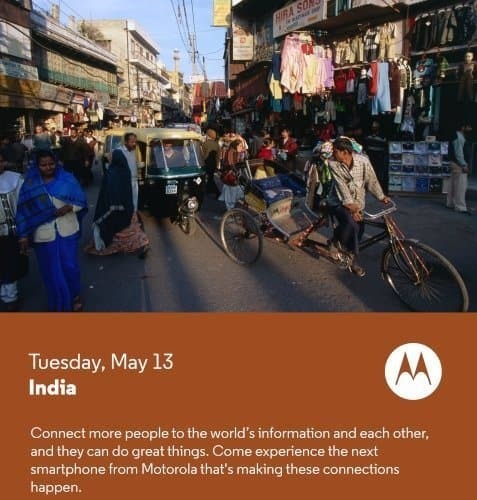 So, we will get to see Moto E around the world on 13th Mag, and this will include India also. So, guys who are thinking about a budget Android phone, I think you should wait two more days and think about this stuff from Moto. Till then, keep reading our other articles to know more about the world is smartphone, gadgets and more. Stay tuned!! !